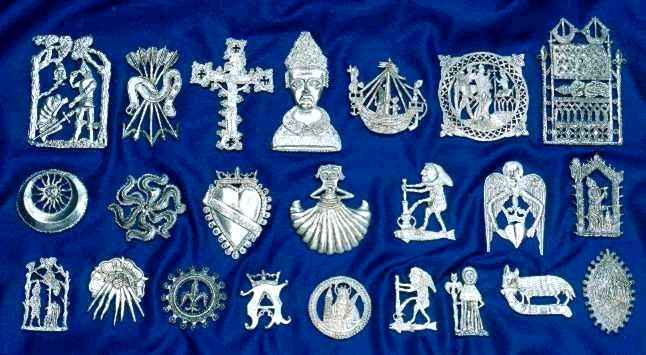 All badges supplied with lapel pin fixings. Saint Alban (large). 1400's. Englands first Christian martyr. Having just beheaded St. Alban, the eyes of the Roman executioner pop out on their stalks. Height 6.5cm. Price £ 4.00. 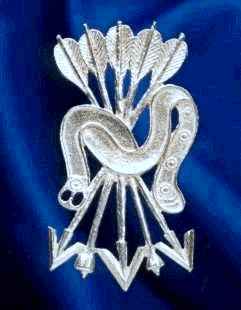 Livery Badge (arrows). 1480's. 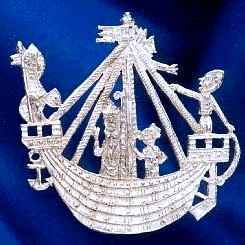 Badge of Arthur, Prince of Wales. The design shows target arrows: broadheads and blunts with sowsback fletchings, which indicates a sporting rather than military use. Height 6cm. Crucifix. 1420's. Showing the Holy Rood at Boxley Church. This was an ornate screen that incorporated a large figure of Christ which, at certain times, was seen to move its eyes and even shed tears. Pilgrims flocked to see it in their thousands. It was only much later found to be a complete fake. Height 6.8cm. Price £ 2.50. Thomas Beckett. 1400's. Murdered in Canterbury Cathedral, Beckett was the most popular of English Saints, and Canterbury soon became the most important destination for pilgrims. Height 7cm. Price £ 3.50. Becketts Exile. After six years in exile in France to avoid conflict with Henry II, Beckett finally returned to England in 1170. 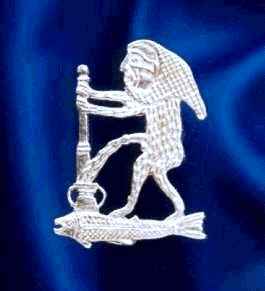 He is shown here on board a square-rigged cog, standing in the centre, his hand raised in blessing. Height 4.5cm. Beckett Slain. 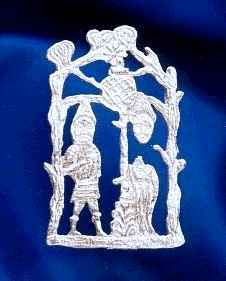 This incredibly detailed badge dates from the mid-fourteenth century, and shows the scene at the alter as one of the four knights (all wearing full armour), brings his sword down on the neck of the kneeling Beckett, which decapitated him with a single blow. Height 5.2cm. Price £ 4.00. Becketts Shrine. Dated between 1350 and 1400, this badgw shows the ornate shrine in Canterbury Cathedral. Above the figure of Thomas is a large jewelled chest, at the centre of which is a massive ruby which was given by the King of France. Height 7.5cm. Price £ 4.00. 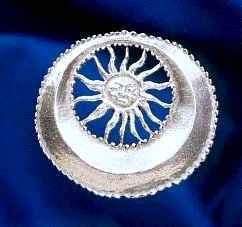 Star in Crescent. 1400's. 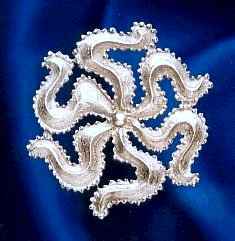 A popular symbol of the Plantagenets. Height 3.6cm. Price £ 2.00. 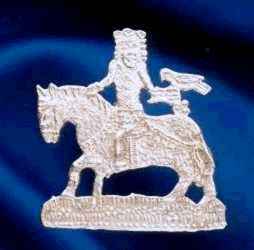 Yorkist Sun. 1450's. An heraldic 'estoile' type, or it may represent the Star of Bethlehem. Diameter 4.2cm. Price £ 2.50. Lovers Token. 1400's. 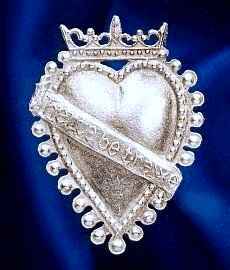 A crowned heart, with a diagonal band having the inscription "Herte be trewe". Surrounded by pearls representing purity. Height 5cm. Price £ 3.00. 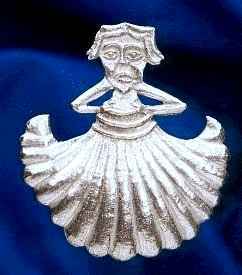 Saint James (scallop shell). 1375. 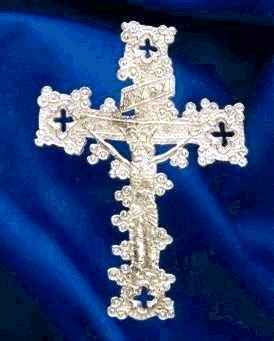 This was the symbol of the apostle Saint James the Greater. His shrine at Santiago di Compostella in northern Spain was the most important destination for pilgrims. Height 5cm. Price £ 3.00. The Physician (large). 1420's. A parody of the early medical profession. As the monasteries ran hospitals the treatment of injury and illness was considered a religious duty. 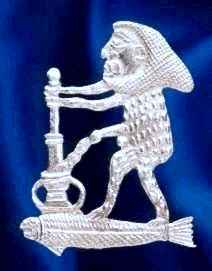 The emerging secular science of medicine was considered with suspicion, so this badge shows a monkey wearing a monks cowl, as he urinates into a pestle and morter, (illness was diagnosed by studying urine and the pestle and morter represents the trade of the apothecary). Height 4.5cm. Price £ 3.00. Winged Heart. 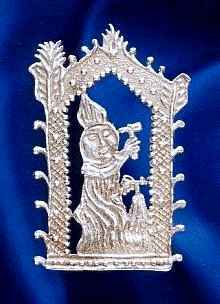 Mid-fourteenth century and an emblem of the Blessed Virgin. 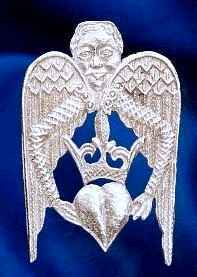 The heart is carried by the Angel of the Annunciation. Height 5cm. Price £ 3.00. Saint Dunstan. 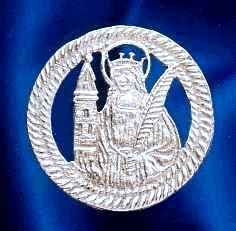 The Patron Saint of bellfounders, metalworkers, engravers and jewellers. On the continent he is known as Saint Elegius. Height 4.5cm. Price £2.00. 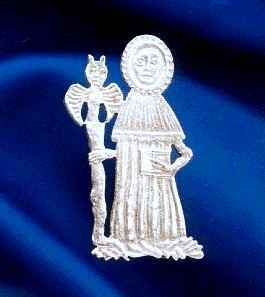 Saint Alban (smaller version). Height 4cm. Sun and Rose (Rose en Soleil). 1470's. 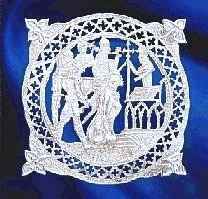 Popular Yorkist symbol of Edward IV. Height 3.5cm. Price £ 2.00. 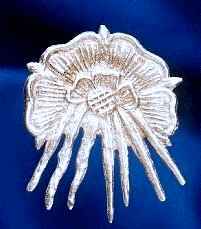 Fleur de Lys. 1450's. 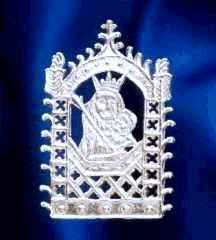 The symbol for our Lady of Undercroft at Canterbury. 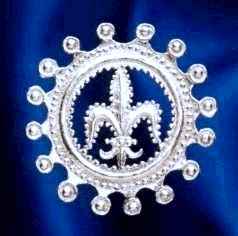 The fleur de lys represents the Lily, or the Flower of Innocence. Diameter 3.5cm. Price £ 2.00. 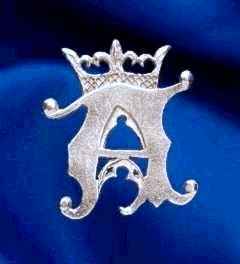 Crowned 'A'. 1400's. The letter 'A' represents "Amor Vincit Omnia"- "Love Conquers All". 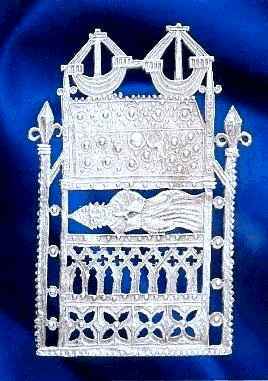 This may refer to the love of God, or it may indicate its use as a lovers token. Height 3.5cm. Saint Barbera. 1400's. 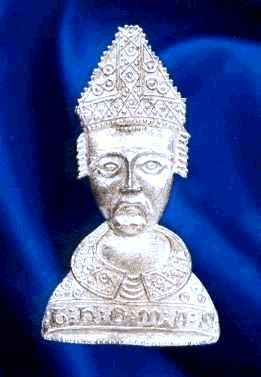 St. Barbera protects from fire, lightning and explosions, so she is the Patron Saint of firemen, miners and gunners. Height 3.5cm. 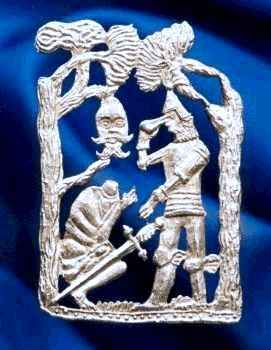 Physician (smaller version). Height 3.5cm. The Assumption. 1450's. Showing the Blessed Mary of Eton College, being transported to heaven by angels. 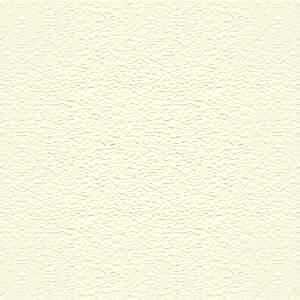 The border represents pearls for purity. Height 4.5cm. Price £ 2.00. John Schorn. 1480's. He was a famous preacher and a famed exorcist from North Marston. It was said that he tricked the Devil into his boot and so trapped him, but the Devil escaped through the lace holes. Height 3.5cm. Price £ 2.00. Cat and Mouse. 1400's. Representing the triumph of good over evil. 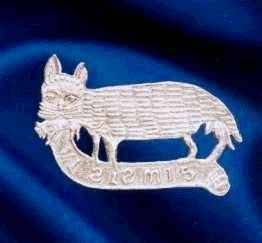 The latin motto "Vi Sis Mis" means "I have the mouse". Length 4.7cm. Price £ 2.00. Madonna and Child. 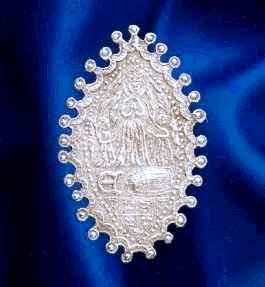 Fifteenth century and relating to Our Lady of Walsingham or possibly Willesden. Height 4cm. Price £ 2.00.
a falcon. Height 4cm. Price £ 2.00.